Bonita (Bonnie) Moreno was born September 12, 1924 in Bartlesville, OK. She grew up on Bean Lake. Her best friend was her brother Bud. She married Gilbert (Sticker) Moreno in Victoria, TX on March 13, 1945. Between the two of them they had exactly $13.00 at the time. They settled in Kansas City after WWII and had 5 children. Bonnie was a working mother. She had many different jobs over the years. She worked as a mig welder for TWA. She did some modeling for a brief time. She also worked at an ice cream factory (her kids loved the ice cream she brought home). She was an inspector for American Can Co and later for Whitaker Cable. She also sold life insurance for a time and received top salesman recognition. Her hobbies/skills were many. 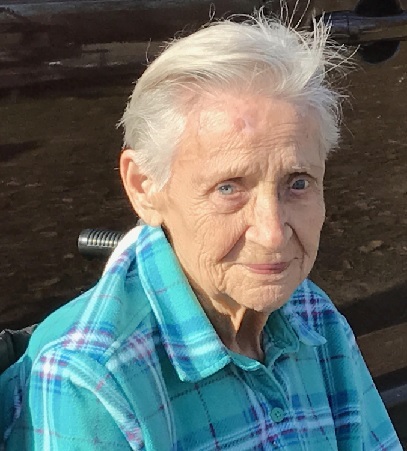 She enjoyed gardening, sewing, crafts, remodeling, and decorating their homes and most of all spending time with her children and grandchildren. Bonnie was a member of Gashland Baptist Church and she hosted bible studies in her home. She is proceeded in death by her husband of 68 years Gilbert, her daughter Susie, grandchild Kimberly, and great grandchild Rahsaan. She is survived by her children Bambi Hadley husband Junior, Rick Moreno, Becky Ulm husband Tom, and Dan Moreno. Son-in-law Leonard Kellough, 8 grandchildren, 12 great grandchildren, and 1 great great grandchild. To my Mom: What is a Mom? A mom is one of life’s best gifts, Someone to treasure all life through, She’s caring and loving, Thoughtful and true, Someone who is always a special part of your life, Someone who holds a prime place in your heart, She’s a mentor, a confident and also a friend, Someone on whose love you can depend. A mom always has your best interests at heart, She’s someone so dear and so good, She’s a blessing, she’s a gift, She’s a treasure like no other, She’s someone that is truly wonderful. Wherever you go, and whatever you do, A mom’s love will always see you through, A mom is truly invaluable, Indispensable and unforgettable. I wouldn’t want anyone but you, And that’s why I’m so grateful, that life picked you for me.